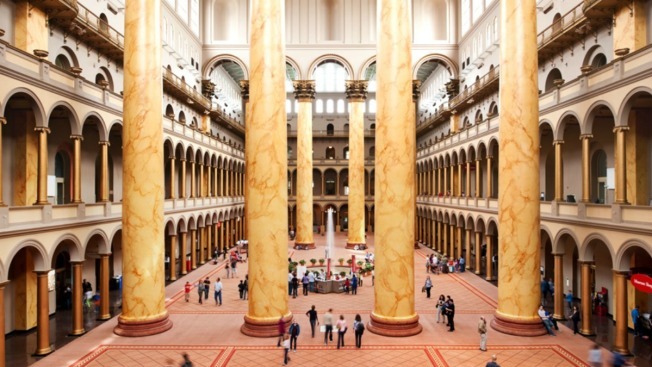 The Great Hall of the National Building Museum, where the Big Maze exhibit will be built. Get lost. At the National Building Museum's new Big Maze exhibit, that is. Starting July 4 and running until Sept. 1, visitors will have the chance to explore a gigantic new exhibit that challenges expectations of what a maze should be. Big Maze is designed by the Bjarke Ingels Group, an international team of architects run by Danish-born Bjarke Ingels. The plywood structure will take over the West Court of the museum's Great Hall and will offer guests the chance to explore the imposing structure unaided. From the outside the maze will tower over the hall with its 18 foot walls, but as guests delve further into the structure, those walls will gradually lower -- offering a unique inversion of the maze concept. Finally, from the center of the structure guests will have a clear view of their escape route, and it will also be possible to view other visitors enjoying the exhibit, from the floors above. Tickets are only available in person and cost $16 per adult, and $13 for children but lower prices do apply for museum members. Find out more information, including late nights and special pre-opening "buildout tours," at the museum's website.